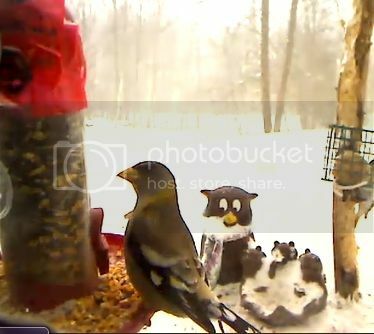 NovaBirds Cam Blog: Grosbeak alert! A visit from an Evening Grosbeak. I can't help but get excited to see an Evening Grosbeak at the feeder! I *think* this is a female..although it may be a male with more drab, winter plumage. Either way, it's nice to have another visit from them! It seems that whenever the bad weather strikes, a Grosbeak arrives to cheer things up! Keep an eye on the cam! You may get a chance to see one!